Rates assume current model year, a 40-year-old male driver with no accidents or violations, $500 comprehensive and collision deductibles, minimum liability limits, and uninsured/under-insured motorist coverage included. Rates are for comparison only and are averaged for all 50 U.S. states. The prior chart uses the average vehicle rating data for all Ford models in the table above to demonstrate how different rating information can influence auto insurance prices. Insurance prices for a Ford range considerably based on liability limits and deductibles, your driving record, and the model of your Taurus. An older driver with no violations or accidents and higher deductibles may pay as low as $1,300 annually on average, or $108 per month, for full coverage. Rates are much higher for teenagers, since even excellent drivers should be prepared to pay in the ballpark of $5,100 a year. If you have a few points on your driving record or you were responsible for an accident, you may be forking out anywhere from $1,700 to $2,300 additional every year, depending on your age. 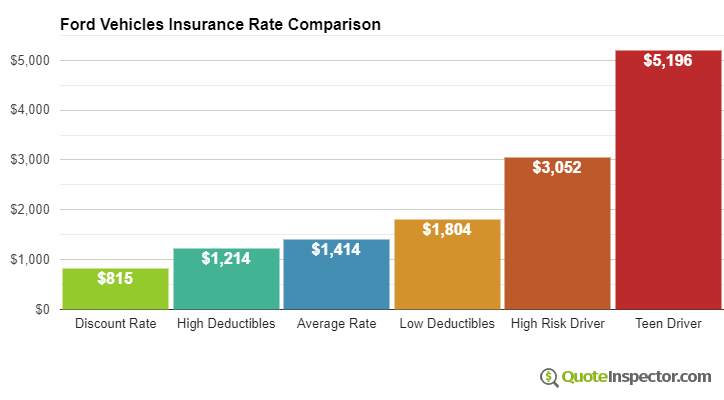 High-risk driver insurance ranges from 44% to 134% more than a normal policy. Your home state plays a big part in determining prices for Ford insurance prices. A good driver about age 40 could pay as low as $1,020 a year in states like Utah, Ohio, and New Hampshire, or be forced to pay as much as $1,860 on average in Montana, Michigan, and New Jersey. Because rates have so much variability, the best way to find out which company is cheapest is to compare rates from multiple companies. Each auto insurer uses a different method to calculate rates, and rates will be varied. National average data is compiled from all 50 U.S. states for the Ford models in the rate table on this page. Rates are based on a 40-year-old male driver, $500 comprehensive and collision deductibles, and a clean driving record.